Blog — A Pretty Little Letter. My childhood friend, Gloria, attended with me and we had a blast. Gloria is a busy bee, working full-timing, completing her Master’s and is involved with Junior League. We went to a Christmas crafting event last year and enjoyed getting away from the craziness of life to hang out and learn a new craft, or at least attempt to. Start by creating a cage out of chicken wire or by criss-crossing floral tape over the opening of the container. Create a base with greenery along the rim of the container. Try not to let the edge show through. You can have pieces of greenery hanging over a bit. Add height with accent flowers. These flowers had a great color and were fairly sturdy. The droopy looking pink ones were added to give the arrangement a different direction of dimension. The delicate pink and white flowers stole the show. I tried to add them at different heights, but somewhat near each other. Rule of 3: Your eyes are drawn to multiples of three! 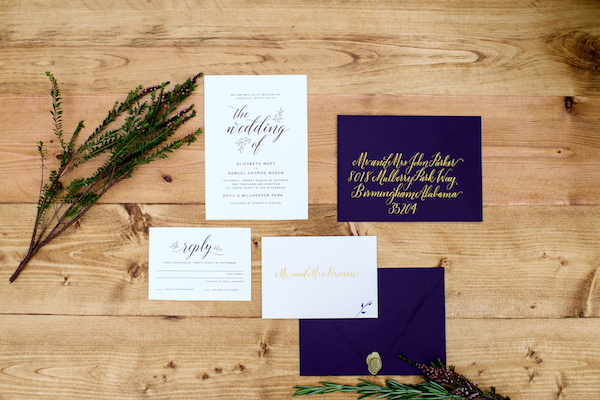 An aubergine and gold color scheme set the tone for this styled shoot. I was delighted to work on my first SMU graduate wedding this past year! The McCoys decided on a fun, modern calligraphy style to complement the calligraphy on their wedding invitations. 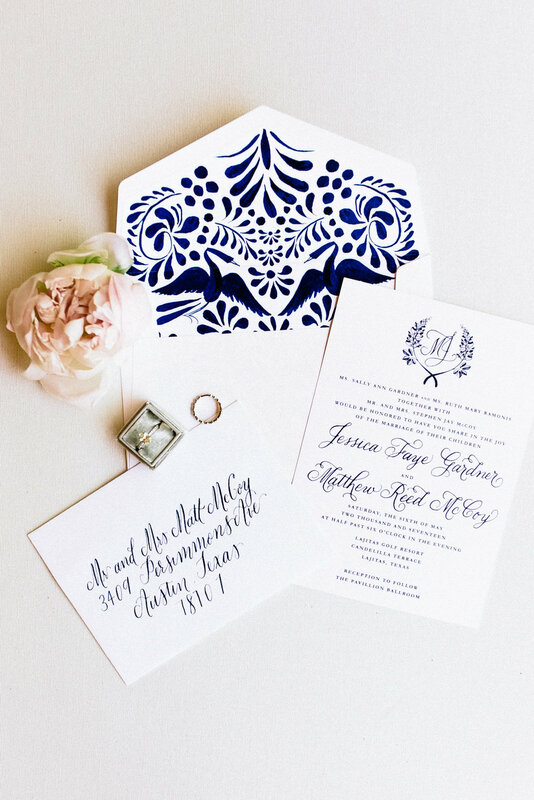 Navy ink on crisp white envelopes is one of my go-to color combinations! My favorite element of their invitation suite is the envelope liner, a nod to their destination wedding in Lajitas, Texas.